Writing is all about making meaning. The prospect of teaching writing to a classroom full of students—some who speak English and some who don't—can be overwhelming. When students learning English are at different levels, the task is even more challenging. Juli Kendall and Outey Khuon experimented with Ellin Keene's “Thinking Strategies Used by Proficient Learners” and found that by integrating writing and reading instruction their English language learners became stronger writers. 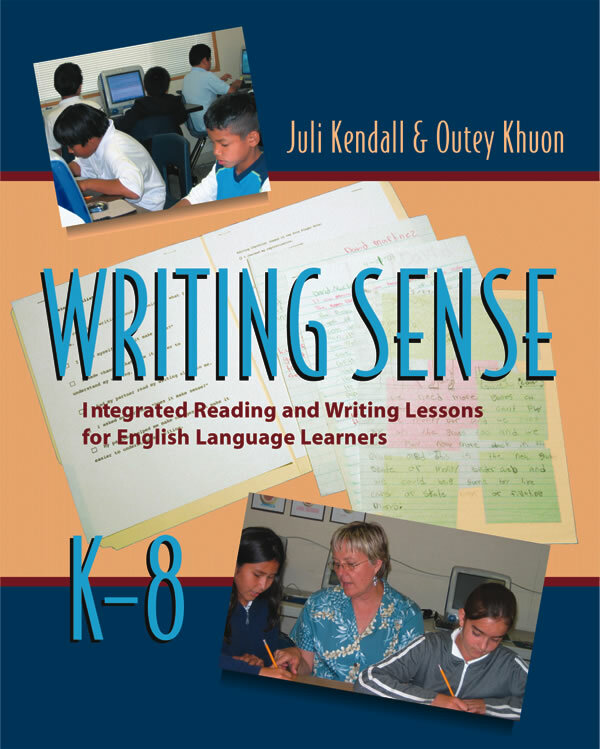 Writing Sense outlines the classroom conditions necessary for successful writing instruction with English language learners, whether in writing workshop and/or small-group instruction. It includes sixty-eight classroom-tested lessons for grades K–8 that show kids at all levels of language acquisition how to make connections, ask questions, visualize (make mental images), infer, determine importance, synthesize, monitor meaning and comprehension, and use fix-up strategies. Like the authors' earlier book, Making Sense, the five main sections are geared to the stages of language proficiency, and lessons are divided into “younger” and “older” students, spanning kindergarten through to grade eight. There are extensive lists of suggested books for mentor texts as well as lists of mentor authors to facilitate teachers' planning and instruction. A lifelong teacher, including a professional partnership with coauthor Outey Khuon for fifteen years, Juli Kendall taught kindergarten through eighth grade and was a Literacy Specialist. Outey Khuon began teaching in Cambodia in 1969. Since 1992, she has taught elementary students in Long Beach, California, where she is currently a Literacy Specialist. She has presented at many state and national conferences and workshops and is a lecturer in the Linguistics Department at California State University, Long Beach.